1. In bowl, combine oil, vinegar, lemon juice, mustard and garlic. Whisk together vigorously. 2. 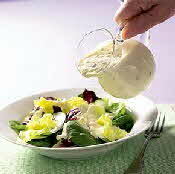 Fold in sour cream and mayonnaise; whisk again until thoroughly blended. 3. Stir in cheese and green onions. Stir in salt and season with pepper.